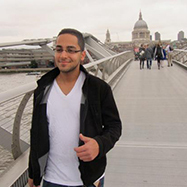 Senior finance student Amyn Jiwani is the president of Phi Beta Lambda, a student business leadership organization. Edison, N.J., is a long way from Mumbai, India, and Amyn Jiwani’s old stomping grounds in Bollywood, where he lived down the street from movie sets and movie stars. Okay, stomping grounds may be a stretch. The senior finance major was only nine years old when he moved to the States with his older sister and parents, looking for a better way of life. From a young age, Jiwani was exposed to business, spending summers with an older cousin and uncle, a successful serial entrepreneur, who always pressed their younger relative about his future aspirations. Seems like they were on the money. After three great co-op positions at Blackrock, Susquehanna and Exelon, Jiwani is pursuing a full-time job in asset management. While he has always looked toward the future, he continues to do everything he can to make the most of his time in school before he endeavors into the real world. For example, during his pre-junior year, Jiwani spent the summer abroad, visiting England, Spain, Brussels and the Netherlands, while taking classes in Shakespeare, History of Modern Design, British Culture and Visual Media and Personal Professional Selling. He also attended some events of the 2012 Summer Olympics in London, an opportunity that he, and most people, would consider once-in-a-lifetime. With only a few months left at Drexel, Jiwani shows no signs of coasting toward graduation. In fact, he’s getting ready to compete at the state championships of Phi Beta Lambda, a student organization that challenges members to develop their business and leadership skills. Since freshman year, Jiwani has served on the Phi Beta Lambda executive board and this year serves as Drexel’s chapter president. The organization, whose tagline line is “Future business leaders” invites students from all disciplines to participate and compete in a variety of events that tests their business acumen, among other subjects. If all goes well, he and his teammates will head to the nationals where the testing gets more challenging but the opportunities to network are greater, too. While he Jiwani has enjoyed most of his classes at LeBow, he is particular fond of Finance 325 and 338 taught by Barry Halvorsen, an adjunct professor of finance. Jiwani says that he doesn’t have much free time but when he does, he likes to read. He recently finished The Black Swan, Outliers and Physics of the Future, all non-fiction tomes that highlight different aspects of finance. He has also recently opened his own brokerage account, investing his own money to gain experience, and of course, some cash. When Robert Reid saw a posting for an all-expenses-paid co-op with SEI in London, he knew he had to apply even though he didn’t think his chances were very good.